For the third time, Tableau is a leader in the Magic Quadrant for Business Intelligence and Analytics Platforms report. The Gartner annual report on the Business Intelligence and Analytics market carries special significance because it reflects the innovations and changes that are driving the market. An important aspect of this analysis is the Magic Quadrant, which shows the relative position of each competitor in the business analytics space. For the third year in a row, Tableau is proud to be a Leader in the Magic Quadrant. This year, Gartner placed Tableau highest in ability to execute. The trends that Gartner discusses in the report are familiar. Customers in the Business Intelligence marketplace are demanding products that are easier to use, accessible to everyone, and simple to integrate with existing systems. Tableau has eagerly pursued innovations in these areas and we are pleased that Gartner has affirmed our position as a leader for 2015. Our work is far from over. Tableau 9 is coming in the second quarter of 2015, packed with dozens of new innovations to help people see and understand their data. Over the next several years, we have committed to a continued focus in R&D spending to help drive the innovations that our customers expect from us. With these investments, we intend to remain a leader for years to come. Traditional BI market share leaders are being disrupted by platforms that expand access to analytics and deliver higher business value. BI leaders should track how traditionalists translate their forward-looking product investments into renewed momentum and an improved customer experience. Sometimes it can be a little lonely starting a new trend, like self-service analytics for everyone. Even if we are a bit of an outlier, we're lucky to have the best customers in the world to keep us company. Speaking of which, we want to know about the trailblazers and trend starters in your life. If you know someone who is leading the way and doing things differently (but in a good way! ), tag an #outlier and tell the world. 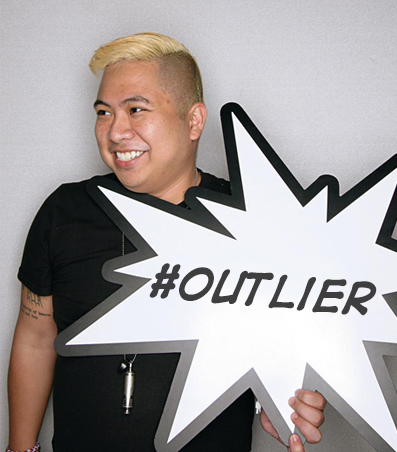 The first 100 people to post their favorite #outlier to Twitter, Facebook, Google+ or LinkedIn will get a special Tableau Tee. *Gartner “Magic Quadrant for Business Intelligence and Analytics Programs” by Gartner, 2015. This graphic was published by Gartner, Inc. as part of a larger research document and should be evaluated in the context of the entire document. The Gartner document is available upon request from Tableau Software. Gartner does not endorse any vendor, product or service depicted in its research publications, and does not advise technology users to select only those vendors with the highest ratings. Gartner research publications consist of the opinions of Gartner's research organization and should not be construed as statements of fact. Gartner disclaims all warranties, expressed or implied, with respect to this research, including any warranties of merchantability or fitness for a particular purpose. **Gartner Magic Quadrant for Business Intelligence and Analytics Platforms” by Rita L. Sallam, Joao Tapadinhas, Josh Parenteau, Daniel Yuen and Bill Hostmann, 20 February 2015.